AroundMe | iPhone, iPad and Android App to quickly find information about your surroundings! Hungry and looking for inspiration? The inclued Apple Watch app with a simple tap shows the result directly on your wirst while your iPhone is in your pocket. So whether you’re home for the weekend, in New York for work, or vacationing in Seville, Nice, Milan or Tokyo, AroundMe provides simple access to local information. AroundMe will help you making a choice by showing over 500.00 restaurant menus. 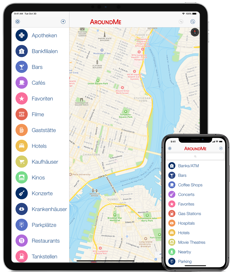 And when you find your favorite place you can use the app to navigate to the venue: directly within the app or by transfering the result to the Apple Maps, Google Maps, Navigon, TomTom and many others. and is available in English, German, French, Spanish, Italian, Japanese and Chinese. Copyright © 2015 Flying Code Ltd - All rights reserved.